The snapshot view gives the basic info about the Eastern States field listed by general estimated TR (Tully Runners) speed rating averages. For the NY teams, the TR score is fairly precise based on the 2018 action. For outside-of-NY teams, the TR is the score for the team's last big meet and is thus less comprehensive than the NY teams' season-compiled scores. It could miss runners who were not at the selected meet. There are also some teams that have not yet competed in a meet with posted results, and obviously there is a lot of guesswork needed there. Finally, there are some squads that will only be putting one or two runners on the line. 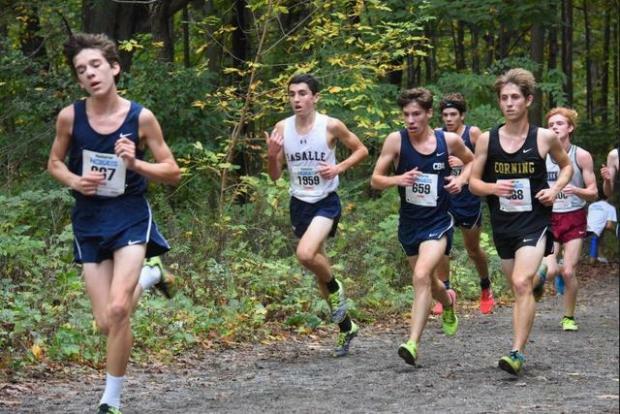 The rankings cited are from MileSplit National speed rated or State listings. Rankings are from the most recent week. The snapshot listing is not intended to be a prediction of the finish in the race. Some teams are extremely unbalanced with one or two runners at the top and a big gap to following runners, and these teams generally do not finish as high as their estimated TR would indicate, if they are among the top teams where strong packs are good. The balance factor switches for teams in the bottom part of the results though, where having one or two high-flying runners can move a team up. The Spread number in parentheses following the TR average indicates the gap between the first and fifth runner numbers, with each point equaling about 3 seconds in a 5K race or maybe 2.67 seconds at VCP's 2.5 mile course. As can be seen, Westfield has a low spread number which should help them run better than their speed rating would indicate. TRs are general estimates of team strength, so use them here as just broad indicators of the range in which a team is expected to run. Based on a big database of past results, the TRs serve as remarkably accurate predictors for races that have enough associated team data, and they are many orders of magnitude better than the divining rods or straight time results that are often used to estimate team strengths.